We are vigorously occupied in offering our customers the best range of PP Woven Bag. These PP bags are stitched using the finest quality material in obedience with set industry standards. 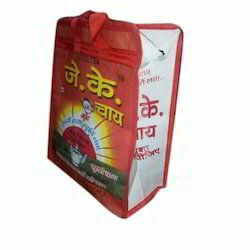 These PP bags are tried on numerous quality constraints and can be availed by our customers at market leading price. We CH ENTERPRISES offer fertilizer bags to our customers. Supported ourselves with proficient amenities, we are readily instrumental in providing an inclusive variety of Woven Bags. Circular woven design – a bag which is specifically designed to hold the loop up for their easy access by the fork lift. The belt is stitched on the fabric and a special reinforcement of fabric is done on the area where the belts are stitched. A bag with such a design is popularly known as cross corner loop bag as the loops are crossing the corners of the bulk bag. Laminated/Unlaminated PP/HDPE Woven Bags & Sacks is largely used as a substitute for jute and paper packing. These water resistant bags and sacks are light and strong enough to handle strains. We are offering our clients a quality range of Rice Woven Bags. We are engaged in offering HDPE Printed Woven Bag, which is extremely praised in the market.